MY WINE BOTTLES LOVE THEIR NEW HOME !! I don’t have a huge wine collection. For the past many years what I did have rested comfortably on a variety of store-bought racks holding 18, 24 or 36 bottles plus a wine refrigerator that held another 32 bottles. Many of the bottles would stay in their original cases which often prompted my wife to threaten to throw them out if I didn’t get them out of their boxes. 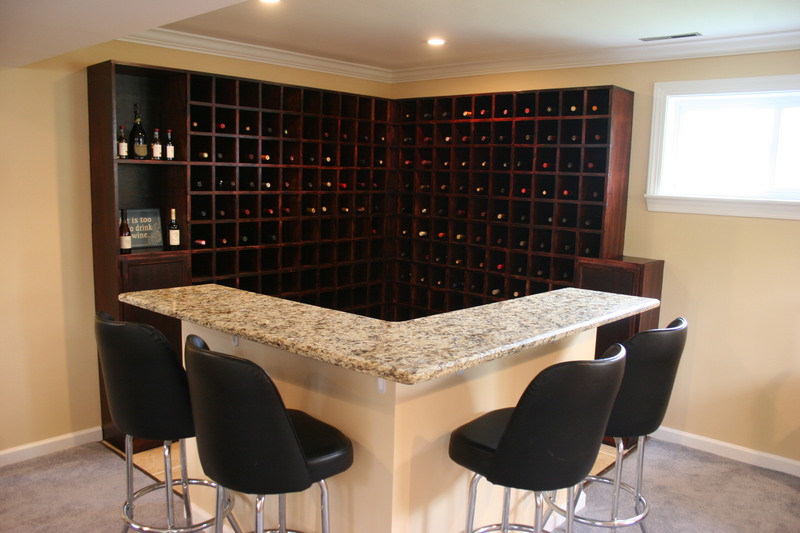 The problem has now been solved with the recent addition of hand crafted wine racks made by the fine folks at Arch General Contractors. We were having some renovations done to our Rec Room, mainly, the removal of a large pillar that served as a supporting column for the house. We replaced it with an overhead beam which opened the room and gave greater depth. It seemed like the perfect occasion to add some racks and get all of those bottles a proper home. I am delighted at the way the finished racks look and the bottles have told me they love their new home. My new problem is that I have some empty slots which need to be filled with vino and that can only mean additional purchases. As you can gather from all this, wine collecting is a dirty job but someone has to do it.